(Nanowerk News) Electronic components generate a great deal of heat that can detrimentally affect device performance, particularly state-of-the-art high-power computer processors. Now, stacks of integrated electrical circuits can be cooled by water using a system designed and built by a research team from the A*STAR Institute of Microelectronics and Nanyang University in Singapore ("3D packaging with through ilicon via (TSV) for electrical and fluidic interconnections"). Integrated circuits combine passive electronic elements such as resistors and semiconductor devices on a single substrate. To achieve a higher density of components, engineers are developing methods for stacking these circuits. Keeping the tightly packed layers cool, however, is a challenge. In computers, for example, fans are used to circulate cooling air, but air is an inefficient conductor of heat. “The heat must be removed from microchips to maintain a temperature within acceptable limits: less than 100 °C,” explains team-member Navas Khan from the Institute of Microelectronics. Khan and his co-workers therefore focused on a system using circulating water. 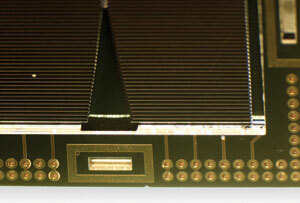 In their design, each integrated circuit sits on a silicon chip carrier through which the cooling water flows. First, however, they had to consider how to connect subsequent stacked layers. Khan and his team made the electrical connections between two circuits by etching holes straight through the substrate, a commonly used technique called ‘through silicon via’. They then applied the same concept to pass cooling water from one chip carrier to the one above it through four 500-micrometer holes. A solder consisting of tin and gold hermetically sealed the structure up to pressures high enough to ensure that no water could escape and disrupt the electronics. Fig. 1: A chip carrier patterned with horizontal fluidic microchannels that ensure that integrated electronic circuits stay within operating temperatures. To optimize the cooling, the researchers patterned the chip carrier with a network of microchannels (Fig. 1). Their design also included two water inlet ports and two outlets, rather than just one of each, to minimize any pressure drop across the structure. This meant that they could use a mini pump to circulate the water around the module. Khan points out that the tapered fin arrangement with inlets smaller than the outlets led to a uniform water flow and more effective heat extraction. The whole module, including the pump and the heat exchanger through which the heat was expelled, took up an area of only 5 × 5 cm2 and was able to extract up to 200 watts of heat. Khan hopes that future designs using two-phase cooling will remove even more heat.